Next week, we're heading out to Hawaii. We love going out there. The kids love playing in the water, and we stay in beautiful resorts that feel like paradise. We live a blessed life, and we know it. Jeff and I say it to each other almost everyday -- how lucky we are to live as we do. We have very few worries, we have beautiful children, and we have each other. Last summer, we took my parents with us. It was our way of saying thanks for them helping us with our daughter after she was born. They put their lives on hold for almost a month to help us out, and we repaid with ten days in Big Island. When we stepped into the lobby of The Fairmont and saw the panorama of the resort grounds, my parents' jaws dropped. I had taken them to Hawaii before, but we didn't stay in such a nice place last time. Every morning, before we even woke up, they had walked all over the grounds, looking at all the flowers, the trees, the birds, and the geckos. Then we met for the breakfast buffet, where they piled up their dishes as I had never seen them piled up before. Then they got up for a second round, before going back for desserts. After eating, we usually headed over to the beach so that my son could play in the water while I sat under the cabana with our infant. 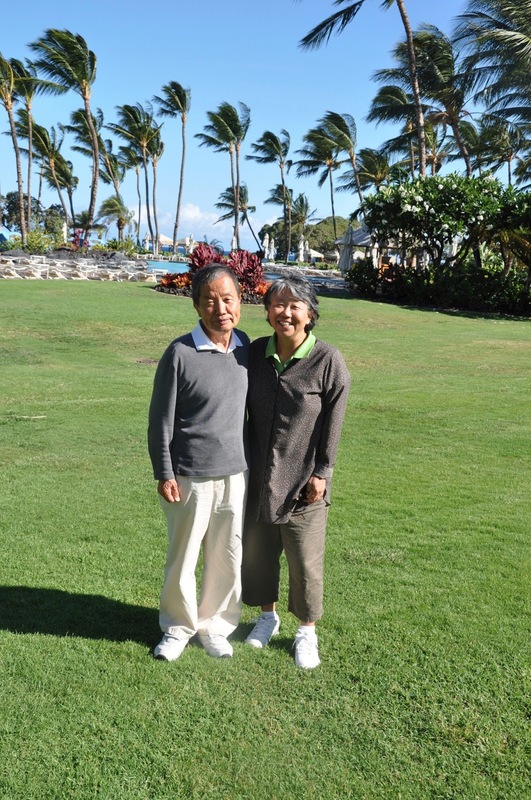 My parents joined us some mornings, and on others, they went to play golf. Then it was time for a meal of crab rolls and hamburgers. After, the kids napped indoors while my parents napped in the cabana. In the evening, we went out for dinner and ate delicious sushi at the fabulous Monstera restaurant right outside the resort. I had never seen my parents so relaxed and happy. Most times, when my parents visit, my mom is so busy trying to help that we usually get into arguments. I ask her to stop doing my laundry or my dishes, and she shoos me away, telling me to go watch my kids. Then, she gets exhausted and then gets irritated with my dad for not helping enough, even though he does everything she asks him to do. When we were in Hawaii, there was nothing to do. All they could do was relax on the beach, take walks, or play golf. No time for irritation. This past month, we went to NY to visit them. On a table in their living room, they had the framed photos of Hawaii that I had sent them. And attached to the frame was a coaster from the resort, where my dad had jotted down the dates we had spent in Hawaii. This year, we are going alone, and I felt a little guilty telling them that we were going. But we are already planning a trip to Sedona with them this winter, and I expect my dad to save another coaster from that trip.